MacBook Gets Core 2 Duo; Live Laptop Config; What’s Your Laptop Pick? The other change on the MacBooks, aside from CPU, is RAM. 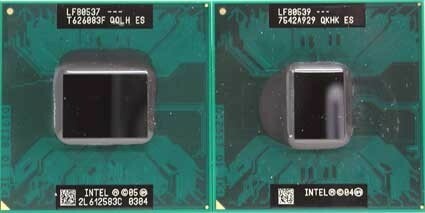 Previous MacBooks had 512M standard (256 x 2); the new model has 1G (512 x 2). That’s kind of a pain, again, since you’ll have to rip out 512M to install a 1G upgrade. I suggest at least installing 1G for 1.5 total, though, and jumping for 2G if you can; if you buy from someone other than Apple, the going rate is about US$160 for 1G even with factory-standard Samsung chips. With a RAM upgrade and a hard disk upgrade, the MacBook should be one lean, mean mobile music machine. Logic Pro 7 and Ableton Live 6 both run beautifully on this architecture, for instance, delivering what feels like desktop-class performance. The 13″ size is perfect for gigs, because it allows you to focus all your gear-lugging pain on stuff like keyboards and controllers. And the glossy screen works just fine in most environments in my experience, despite my initial reservations. They’re portable, bus-powered, reliable, and cheap. Best bargain: get the enclosure and add your own drive. Much has been made of Apple’s claim that the Core 2 Duo is “39% faster” than the Core Duo. Apple didn’t make up that number, though; the issue is that it’s not a real-world benchmark. Check the fine print, and you’ll see Apple uses the SPECint and SPECfloat tests, which are purely abstract/mathematical benchmarks of processing performance. Integer performance is where the Core 2 Duo shines. In real-world situations, you’ll never see a gain that significant. But that doesn’t mean the Core 2 Duo isn’t a good deal. First, normally performance gains come with a corresponding increase in heat and power consumption. Not so with Core 2 Duo. Macworld finds the C2D cooler than the CD in the 2.16 model, and other benchmarks have found similar marginal improvements. Apple’s current claim on the MacBook is actually 25%, and they do cite real world figures, like 20% faster performance in iMovie. Macworld’s benchmarks for the MacBook Pro have been widely quoted as having only a “10%” gain in performance. But take a look at the Speedmark and Photoshop CS2 numbers: major gains. Generally, benchmarks from a wide variety of sources show that the Core 2 Duo kicks into high gear when given a lot of multitasking or multithreading. That should mean it does quite nicely on apps like Ableton Live 6 (which features enhanced multithreading) and Logic Pro, not to mention even a 10% gain — for no added cost — can be welcome when you’re redlining a project. For some PC-side benchmarks, see PC Perspective. Again, overall marginal improvements, but some significant gains in certain areas, and I’m guessing you’ll see better results from audio apps. The Core 2 Duo definitely isn’t revolutionary, and I wouldn’t lose any sleep if you have a Core Duo machine already. But is it worth a speed bump? Absolutely. And if you’ve been delaying purchase on either the Mac or PC side, you may be rewarded by buying now. This naturally turns to the question of which laptop to get. I’ve been eyeing low-end configurations on both the Mac and PC side, and, frankly, it’s a great time to be getting a laptop for music. For US$900-1300, you can get a fantastic machine. The addition of the Core 2 Duo should make the Mac more competitive. There’s still a slight price premium for the Mac over bargain PC laptops (especially from makers like Dell, Toshiba, and HP), but look closely when you comparison-shop. The moment you upgrade a budget PC to a 2G CPU over the now-standard Core 2 Duo 1.66 CPU, you’re generally looking at MacBook price territory. Apple doesn’t offer real custom configuration, but what they do give you is a fairly premium configuration at a competitive price. Also, try this experiment: take a PC that looks cheaper, and add Windows XP Professional. It tends to obliterate the US$150 difference between models. If you don’t get Pro, you’ll not only lose out on some important features, but you’ll only be able to upgrade free to Vista Home Premium, or you’ll wind up stuck with XP Media Center Edition, which is officially incompatible with Ableton Live. Sure, you’ll need an XP license on the Mac to take advantage of dual-booting, but you’ll also have the equivalent of two machines. That said, there are some very appealing deals on the PC side. The Dells, while fugly as all get-out, are really cheap on the Inspiron line. Lenovo recently discounted its IBM-style ThinkPad line, making it as cheap as the bargain-basement C series. Lenovo, you’ll recall, is IBM’s former computer division under new owners. Their new Lenovo-designed models have been roundly judged disappointing. The ThinkPad design is still great, and you could have a fully-loaded ThinkPad for the same price or less than a MacBook. As appealing as dual-booting the Mac is, I think for now your fundamental question is which OS you prefer. If your only reason for running Windows is occasional accounting apps or connecting to the office software you need, then virtualizing or dual booting on the Mac should be just fine. But if you really prefer Windows, I’d get the PC. And if you prefer the Mac, you now have a great option — with the early-adopters having already taken some of the initial bugs (discoloration, heat, weird nosie, reliability problems) while you enjoy the more-polished version.